This is my before-last day in Panama. It was the second time I was here for collecting purposes, and I had yet another blast. When I came to Panama last year, it was just me and Sarah, my wife with a Master of Science in biology degree and a great field assistant. Literally less then a week prior to our initial flight, I decided to change plans and visit a group of researchers at the Universidad Autónoma de Chiriquí in Davíd. This last-minute decision was probably the best decision of that trip. The collaboration has grown into something larger and I was able to visit them again this month and both Sarah and I will go back for collecting and a seminar in July. What did we do? Well. A lot of collecting beetles and bugs, basically. Oh, and spending all evenings at the stereomicroscopes, screening our collections for Laboulbeniales ectoparasitic fungi (see here and here for some info). Since I am interested in Hesperomyces virescens, a member of the Laboulbeniales that focuses on parasitizing lady beetles, we went the first few days on orange plantations. But different from our experience in the summer when we found lots of Azya and Epilachna lady beetles, we only found a handful of our dotted friends every day. Quite not worth spending most of the day on a sun-drenched orange plantation, where – on average – it was about 35 ºC hot. So we decided to shift focus and went collecting in La Reserve Forestal de Fortuna and the Parque Internacional La Amistad. In La Fortuna, we were fortunate with (1) many specimens and (2) many infections! In La Amistad we were less lucky, although it depends on what you categorize as being lucky. We only found a single Galerita specimen, which however was infected. Most of our days ended like this, with insects in a Petri dish to screen for fungi. Beautiful sights on the way to La Reserva Forestal de Fortuna. I think Sarah will be happy she wasn’t on this trip; lots of snakes crawling around in La Amistad! Volcán Barú, or the highest point in Panama, as seen from the orange plantation in Potrerillos Abajo. Looking for insects – especially lady beetles – at an orange plantation in La Estrella. Heliconia flowers are good microhabitats for tiny little creatures. One of the rove beetles I collected in this microhabitat was infected with Laboulbeniales. Yay! I discovered I love Ganoderma coffee! 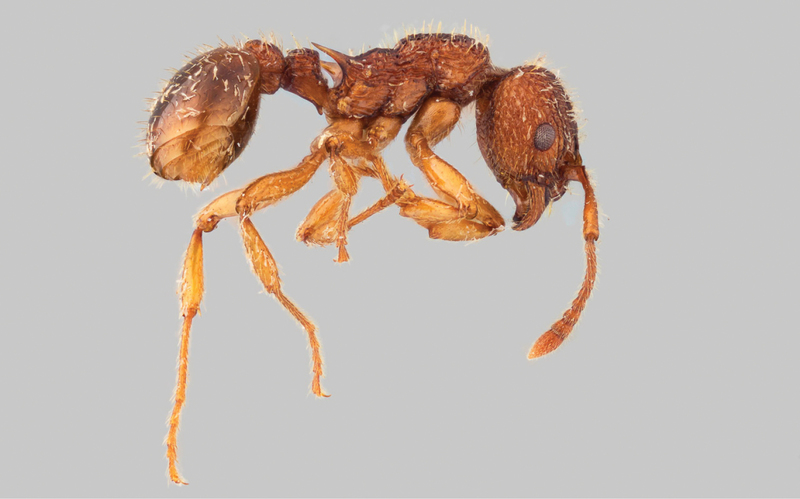 Most Laboulbeniales we identified belonged to the genus Laboulbenia, like this one, which is Laboulbenia perplexa. Working in the laboratory of Dr. Juan Bernal Vega. Posted on January 15, 2016 by Danny Haelewaters. This entry was posted in Blog, Laboulbeniales and tagged Laboulbeniales, Panama, PhD thesis. Bookmark the permalink.